There is no other way to say it. This dramatic headline is the only possible explanation, for the bizarre behavior of Gov. Alejandro Garcia Padilla. One month ago, he tried to privatize the island’s beaches. Two weeks ago he turned over 34,000 acres to the Serallés family, so they can create a low-wage sugar plantation in Puerto Rico. Three days ago, he announced that Puerto Rico has “more self-governing powers” than all 50 US states. All three branches have communicated that Puerto Rico is a US colony. The Obama administration argued that Puerto Rico is a “territorial possession of the US” before the US Supreme Court. The Supreme Court agreed with Obama, in both the Sanchez Valle and Franklin California cases. The US Congress created a Financial Control Board (FCB), to take over the entire Puerto Rican economy. In its very first meeting, the FCB declared its jurisdiction over 28 insular agencies, and the entire government of Puerto Rico. In addition to the FCB, the Jones Act has been strangling Puerto Rico for the past 96 years. Puerto Rico is prohibited from developing its own shipping industry, or from negotiating any of its trade relations with the outside world. The US congress can veto any and every law passed by the Puerto Rican government. With the Financial Control Board in place, there is no point to even having a Puerto Rican “government,” since the Control Board IS the government. WHAT PLANET IS THE GOVERNOR LIVING ON? Surely, the governor must know that this declaration of “self-government” will not fool anyone in Puerto Rico, or help his PPD candidate David Bernier to get elected. This governor is either living on another planet, or suffering from an extended LSD trip. The United States Congress has been in control since 1918 They have been misleading the people of Puerto Rico by pronouncing that you are American Citizens when in reality you are Not unless you were born in the United States, Just ask Mr.Trump when he stated that he will Deport all Puerto Ricans back to the Island unless you were born here and According to Congress he is right. Just Look at all the Congressional paper starting from 1952 to the Present just on the Status of Puerto Rico. You will very surprised.Puerto Rico has always been a Strategic Island and will continue to be just that. Unless the people of Puerto Rico get together on the these coming Elections you will remain to be in LIMBO,Nieder there or here. Have they used the word colony in DC or just territory? I think Sanders used the expression “like a colony”. SELF GOVERNMENT ? SINCE WHEN ? PUERTO RICO, HAS NOT BEING SELF GOVERNMENT SINCE I, HAVE —USED OF REASON. SINCE THE BEGINNING – AFTER OUR —ISLAND WAS INVADED, PUERTO RICO LOST —IT RIGHT TO SELF GOVERNMENT. ALL THE GOVERNMENTS THAT HAVE BEEN APPOINTED, OR ELECTED BY THE PUBLIC, HAVE TAKEN CHARGE OF THE ISLAND, USING DECEIVING TACTICS. ONCE IN CHARGE THEY HAVE BECOME A BUNCH OF —CORRUPT TRAITORS ! THEY ONLY LOOKED AFTER THEIR OWN WELL BEING, NOT THE CITIZENS. THINGS ARE GETTING WORSE NOW, BUT —–THE WORSE IS YET TO COME ! Pinocchio at his best! Don embustero. 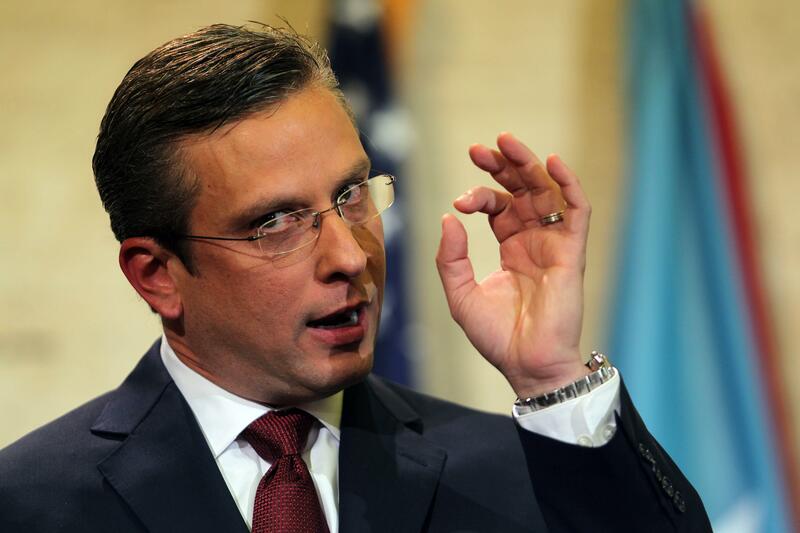 PUERTO RICO’S GOVERNOR —IS LIVING IN A DREAM WORLD ! WITH THE * PROMESA* TAKING TOTAL CONTROL , OF THE FINANCES OF THE ISLANDS, HE IS NOTHING BUT A POPPET WITH NO VOICE ! THERE , NOTHING WORSE THAT SOMEONE TRYING TO PUSHED POWER THAT THEY DO NOT HAVE ! —- THE WHOLE ISLAND— IS BEING —GOVERNED AND CONTINUED BEING STRANGLED BY —-LA PROMESA !! So basically Puerto Rico has no self goverment and no ,nothing .Thank you polititians and US for screwing us up further . The governor of Puerto Rico … is living in the same planet that one of the candidates for the presidency of the USA lives in!